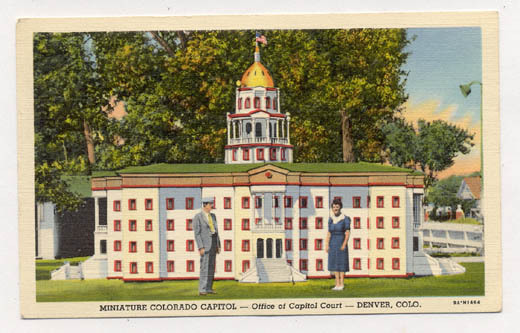 The front of this old unused linen postcard shows an outstanding small replica of the Colorado State Capitol. That great little "building" was there in the early 1950's because a lot of us "kids" saw it. 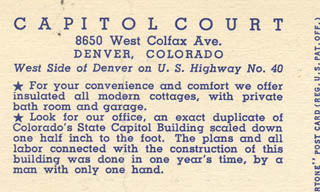 (Hope it ended up moved safely to TINY TOWN) The Capitol Court Motel was located at "8650 West Colfax Ave." on the west side of Denver on U. S. Highway No. 40. (South side of Colfax). I don't think the "capitol" was as big as it looks on this postcard. It seems like it was really only about 7 feet to the top of the flag. It may have been larger, it's been a few years, and I have been known to be wrong! But it really was OUTSTANDING. And even better, the plans and all labor connected with construction of the building was done in one year's time, by a man with only one hand!